After the success of a strong first story there is always a worry that you won’t be able to catch the lightning in a bottle second time round. This is a low key story but still a very good one. 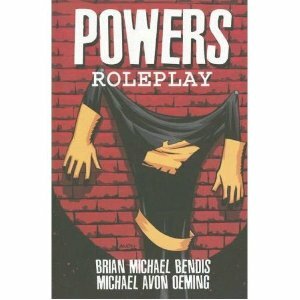 It features kids without powers who dress up as heroes, not to get involved, but to role-play for fun. Good crossover material for the stereotypical comic book reader and not a subject often treated to good quality fiction. The story is indeed king but unfortunately this means that our protagonists get a little side-lined and we don’t get to empathise with them as much. Powers is a delicate balance between whodunit and buddy movie and when that balance is off we feel it. There are a few neat little twists that intrigue us enough to want more so stopping reading is not an option. The art has the same high quality but with fewer issues to make bold moves it feels more subdued than the initial spectacle. The dialogue is still top notch and the lettering and panelling are really pushing the layout envelope. Unfortunately sometimes you get a little lost and end up reading things in the wrong order. This doesn’t spoil the read if you appreciate being treated like an intelligent adult but a few more clues might help keep the flow going. Absolutely a Thumbs Up. More please!